In the first half of the 19th century, there was little social or geographical mobility. By the 1880s, technological and social change opened broader horizons for the younger generation of Jewish men and women throughout all areas of Jewish settlement. In West Prussia, young men left their ancestral towns to seek opportunities in the surrounding area. 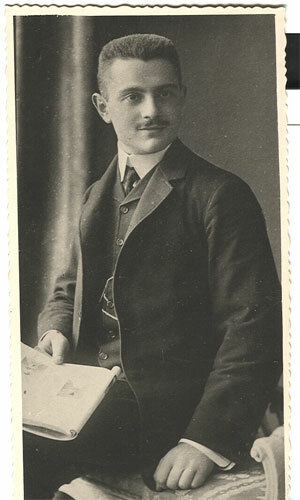 Isaak Wohlgemuth, his older brother Julius and another relative all left Stargardt around 1890 to resettle in the nearby larger city of Elbing. Isaak established himself in the milling business and started a family there. In 1898, he married Betty Katz from the Pomeranian coastal city of Kolberg, where he probably traveled for business. Betty was the daughter of Louis Katz, also a merchant, from Kolberg. Elly was Isaak and Betty’s first daughter, born in Elbing in 1901. A few years after that, they relocated again to the more cosmopolitan port city of Danzig, where another daughter, Hilde, was born in 1906. The family prospered in Danzig. Isaak and his brother Julius were co-owners of a freight and moving business located in the city’s old port district. The Wohlgemuths attended a liberal synagogue congregation and participated in the city's enlightened Jewish cultural scene. They appreciated the benefits of assimilating into the broader German society. They viewed with disdain what they called Ostjuden—orthodox Jews from the Russian Pale who passed through or resettled in Danzig. Yet these unwashed masses were also his company’s clientele, so Isaak still straddled two worlds. In 1912, the brothers decided to cash in and sold the business to a German, Peter Regehr, who continued to operate the company under the Julius Wohlgemuth name all the way to the end of the Nazi period. Isaak took this opportunity to move his family once again, this time to the cultured capital city of the one-time German Empire. He was forty-eight in 1914 and most likely didn’t serve in the Great War. Most Jewish men of age from Isaak’s class and background proudly did their service. Some paid the ultimate price, including several Wohlgemuths from West Prussia who are found on German casualty lists. The Treaty of Versailles in 1919 altered the map. Prussian territories including West Prussia were ceded to Poland, and Danzig was made an autonomous “free city.” For the Wohlgemuths in postwar, early Weimar Berlin, life was beset by inflation and political unrest, but Isaak and Betty nevertheless found Berlin to be a more congenial locale for their style of cosmopolitan Jewishness. They lived in the suburb of Weißensee. As their two daughters came of age, there was no shortage of eligible suitors. A match was made for Elly with a handsome Jewish war veteran, Hermann Ringel, who was fifteen years her senior. 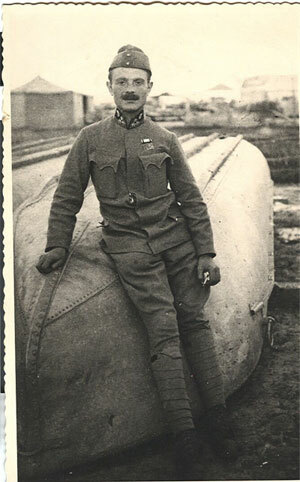 Hermann was already successful in business as a wholesaler of ready-made outerwear for men and boys. He also ran a separate import-export clothing business together with a partner. Hermann and Elly lived at first in Weißensee and later moved to the fashionable Charlottenburg neighborhood. They enjoyed a comfortable lifestyle even though their marriage was not an entirely happy one. Their only child, whom they named Helga Fanny Ringel, was born at Empress Auguste Victoria Hospital in Charlottenburg on October 20, 1924. Elly’s sister Hilde, who was six years younger, later married another eligible Jewish businessman, Herbert Peiser, and little Helga was a flower girl at the wedding. Unlike the Wohlgemuth girls, Hermann was a native Berliner, having been born in the city’s Spandauer district in 1885. At the time of Hermann’s birth, his parents Schija Ringel and Feigel Kaufler were not yet married. They officially wed two years later and had two other children after that. Schija was very likely also in the garment trade. He had come to make his living in Berlin during the socially mobile 1880s, having been born into a Galician shtetl family from the city of Rzeszów. He hired Feigel Kaufler, a young woman from Kraków, as his housekeeper. Evidently, they fell in love. Thanks to the fantastic records kept by JewishGen/JRI-Poland and also to the Geni.com Jewish Families of Krakow project, I am able to trace both the Ringel and Kaufler lines back several more generations. With the Kaufler family, we see that Fiegla Kaufler (1854-1921) was the daughter of Abraham-Moyzesz Kaufler (b. 1829) and Chaja Esther Gruenberg (b. 1826). We can trace Abraham’s line to his father Schulim (b. 1798), his grandfather Isaak (b. 1771) and all the way to his great-grandfather Nachman Kaufler (b. 1755), who seems to have been the original Kaufler in Kraków. For the record, Nachman is nine generations back on my direct family lineage. He started a family that multiplied in Kraków for five generations before Feigel picked up and left to make her future in Berlin. We know less about the Ringel genealogy in Rzeszów, going just one generation back before Schija Ringel. Schija was born in 1856 to Moses Ringel and Rose Lea née Reichman, the first of five or six other children, two of whom also show up in later German records. A brother Jakob Schia Ringel went to Hamburg and raised a family there, and a sister Basze Sure Ringel came to Berlin and married Josef Herzig in 1894. If this Ringel family was typical, we are getting a picture of movement of young Jewish people migrating from their family towns in Galicia to cosmopolitan centers in Germany. This is happening at the same time that a far greater migration of Galician Jews is underway to the United States and other countries, so the inter-European migratory patterns happening at the same time are sometimes overlooked. Rzeszów was a midsize Galician city midway between Kraków and Lemberg, as the present-day city of Lviv was known by its German name. As many as 6,000 Jews lived in Rzeszów in the years of Schija’s youth, about two-fifths of the city’s population. The Jews of Reishe, as it was called in Yiddish, lived in the old quarter and followed a mostly traditional shtetl life focused around religion, family and commerce. Previously a part of Poland, Galicia was attached to the Austro-Hungarian Empire in 1871. The region still ran like a feudal state, with the true power exercised by a handful of Polish landowners. Jews made their living under the economy and laws set by these overlords. Over the previous centuries, through recurring cycles of repression and liberalization, Jews gradually obtained more and more rights. By the time of Schija’s birth, Jews in Rzeszow region enjoyed full citizenship rights in the dual Austro-Hungarian Empire. They could own land, enter the professions, and even vote. Austrian citizenship law considered Judaism to be a religion but not a nationality, as Germans, Poles, Ukrainians and others were considered to be. Jews that absorbed in the culture were identified first by some other nationality and only secondly by their Jewish faith. Thus, a Galician Jew at the turn of the century was typically referred to as a "German [or Pole] of Mosaic persuasion"—a designation that subordinated their true Jewish national identity. Emancipated Austrian Jews could freely engage in commerce with Christian businesses. In Rzeszów, these interactions took place in the markets, bustling with activity as farmers and craftsmen brought their products to the city’s regional fairs. Rzeszów gold- and silversmiths were renowned across the region. In textiles, Jews sold every imaginable kind of garment—furs, leather, shoes, hats, coats and, of course, wonderful fabrics for custom tailoring. Our Ringel family was probably involved in the garment trade in Rzeszów. Moses Ringel could have been a tailor or other craftsman but more likely was involved in the trading aspect of the business—retail, wholesale, supplies or something similar. This is entirely speculative but is inferred from the subsequent history of Moses’s son and grandson, as we will see. Galitzianers who came to Berlin in the 1880s thought themselves modern and progressive relative to the places they came from, but they were viewed quite oppositely by polite Berlin society. They lived and did business in the Spandauer district and most especially in the eastern half of it called the Scheunenviertel, where the sight of pushcarts in the streets and men in strange dress gave the feel of a shtetl right in the middle of cosmopolitan Berlin. This was the world that Schija Ringel came to in the early 1880s. Extending my speculation, Schija was connected to the Rzeszów garment trade and may have been representing a combine of Rzeszów makers in the Berlin market. Maybe he was sent there by business interests or maybe he put it together himself. In any event, he moved to Berlin and established himself in business. From two original certificates that we have, we know that he lived first at Koblancker Straße 14 and later at Rückerstraße 2, both addresses in the Scheunenviertel. Later on, Hermann’s own business address was just around the corner on Alte Schönhauser Straße. As a single Jewish man, Schija would have needed help to keep house and cook for him. He found what he was looking for in an efficient and personable young woman from Kraków. Feigel Kaufler was about twenty-five years old when she arrived in Berlin from Kraków, not a blooming rose but still with prospects to find a suitable husband, she hoped. She was the second daughter of of Abraham-Mojzesz and Esther Chaya. In years past, a Jewish girl in the shtetl waited at home for a proper match to be arranged. But this was a new era. Now a single girl with limited means could take herself to the big city with plans first to secure employment and then to land a husband. Feigel fulfilled both objectives with one man, Schija Ringel, for whom she became a live-in housekeeper. Things got a little messy when she found herself pregnant with Schija’s child without the benefit of marriage. But Schija owned up to his paternity in the 1885 birth record, and he made Feigel an honest woman in 1888, as a record amendment attests. I have not yet determined the Brandenburg law governing Hermann’s circumstances, but his later actions suggest it allowed for a native-born child of alien parents to obtain German citizenship upon reaching the age of majority. Such a child would have lived continuously in Germany since birth and would become eligible for citizenship at the age of twenty-one. Since my mother’s death in 2005, I have had in my possession precious original documents including Hermann Ringel’s birth and death certificate, Feigel Kaufler’s death certificate and Helga Ringel’s birth certificate. I studied them during earlier phases of my research but only now have realized that two of them were not from the original dates but were copies obtained by my family members at a later date. To be specific, Hermann’s birth certificate documents his 1885 birth and includes a handwritten update about the parents’ 1888 marriage, but the copy of it that I have was actually issued in December 1906. Similarly, the copy of Helga’s 1924 birth certificate that I have was actually issued in 1936. So what Hermann was up to in 1906? Among the documentation I have there is also a fascinating Polish language document that is a certification of Hermann’s place of origin. This is dated on August 13, 1906, a few months before Hermann’s twenty-first birthday. This document will play an important role again later when Elly uses it in 1940 to obtain a Polish passport during her flight from Europe. But in 1906 it seems that Hermann had a need to document his legal status as the German-born son of Austrian parents. He must have applied to the municipal authorities in Rzeszów, his father’s ancestral home, and received this formal certificate of his status as a citizen of (or depending on translation, “a national of” or “belonging to”) the municipality of Rzeszów in the kingdom of Galicia. Around the border we see all the geographical designations: Royal Free City of Rzeszów, District of Rzeszów, Kingdom of Galicia, Austrian-Hungarian Monarchy. 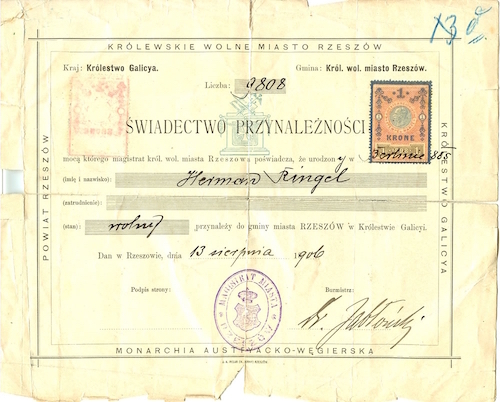 This document provided proof of Hermann’s legal status at the time of his birth. 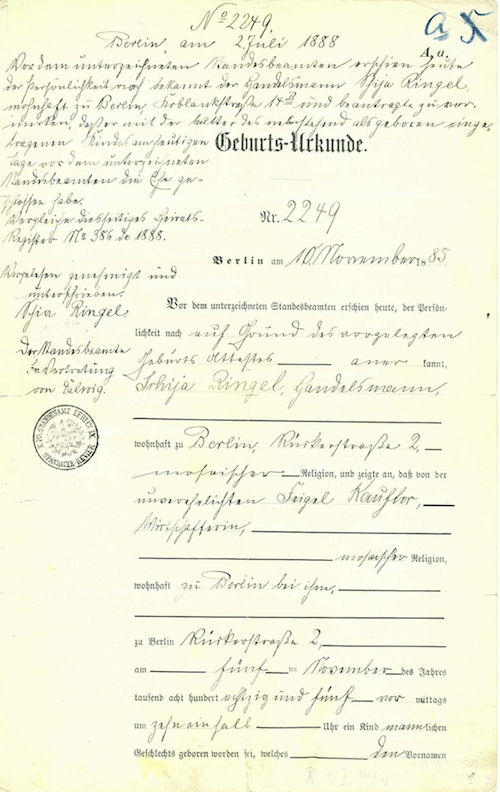 Together with a copy of his 1885 birth certificate with the 1888 amendment, which Hermann obtained four months later, he now— shortly after reaching his twenty-first birthday—had the necessary documents to satisfy the Brandenburg legal requirements to obtain German citizenship. I don’t have in my possession any kind of German nationality document for Hermann Ringel, but there is ample evidence that he enjoyed both the rights and responsibilities of German citizenship during the following 30 years, until the Nuremberg Laws of 1935 stripped away those rights. Hermann served the German Reich honorably in the Great War. War service in the German military by itself did not confer citizenship, however. Witness the well-known difficulties in obtaining German citizenship after the war encountered by a certain Austrian corporal in the German Army. That corporal’s name was Hitler, and he did not become a German citizen until obtaining a special decree in 1932. But Hermann’s situation was different because he served as a German citizen, not a foreign national. In 2012, when Joanne applied for restored German citizenship based only on our Ringel documentation (we had not traced the Wohlgemuth history at that time), the [State Citizenship Office] readily approved her citizenship claim. Thus, the ultimate arbiter of German nationality confirmed in 2012 that Hermann Ringel was a full German citizen after 1906, despite his Austrian parentage.